Some experts reckon all golfers will use shot trackers within the next few years. So some would say Shot Scope are well ahead of the curve as their systems been on the market a couple of years. Their latest launch though, the V2 watch not only includes all their expertise of shot tracking but combines it with the functions you'd expect of a regular gps watch. 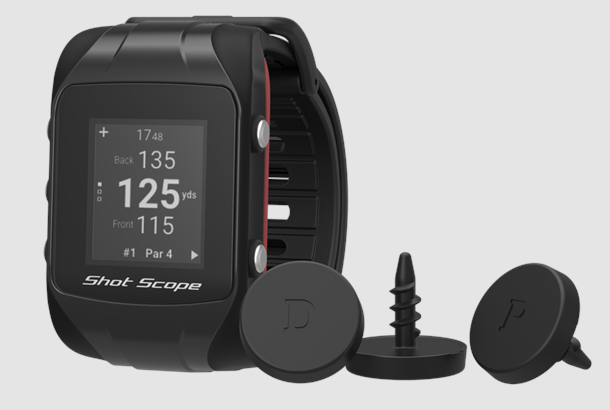 Shot Scope reckon the V2 builds upon the company’s automatic club recognition tech and detailed performance stat output by also providing accurate front/middle/back GPS yardages. Performance stats of this quality have previously only been available to tour players, however V2 uses Shot Scope’s course mapping data to bring the same level of detail to the palm of everyday golfers. The V2's got three built in modes. In both the GPS and GPS+Track modes you get front, middle and back of the green yardages from the golfers real-time position (distances to hazards will be released in a software update later this year). In the Pro and GPS+Track modes the V2 works in the background to collect over 100 tour level stats, which are broken down into five areas: clubs, tee shots, approaches, shortgame and putting.